﻿If there was ever a group that successfully amalgamated Asian and African music with jazz and classic, then it was surely Oregon. With a wide range of instruments and the musicians’ unusually receptive ears for everything here, there and everywhere, Oregon certainly enjoyed the optimal prerequisites. John Towner, Paul McCandless, Glen Moore and in particular Colin Walcott laid the foundations for their music in the musical heaven of their time. Oboe, cor anglais, bass clarinet, six- and twelve-string guitars, piano, flugelhorn, percussion, bass, sitar, tabla – such a versatile range of instruments – lent the nine numbers their, until then, rarely heard sound colouring and mark the transition from the band’s more hippy-like, country sound when they recorded for the Vanguard label to their later classic sound when signed to ECM. 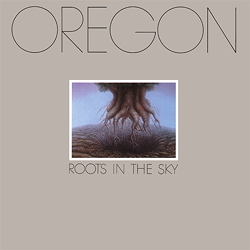 In this respect, "Roots In The Sky" is an important contemporary document in the world of music between 1970 and 1980. A rare black disc on which there is much to discover!